Could Soros Be the Catalyst That Finally Collapses the U.S. Dollar in 2017? The Dow Jones index has returned to the 21,000-point record level. Yet, those investors watching the U.S. political scene might be forgiven for thinking there’s something wrong with this picture. One of these investors could take advantage of both political turmoil and a related market crash to bet on a U.S. dollar collapse. Some investors have built fortunes understanding and exploiting political weaknesses before anyone else. George Soros is one such investor. Soros consolidated his Machiavellian reputation when he made billions betting against the British pound and the Italian lira in 1992. George Soros’s economic prediction ability allowed him to build his reputation as the man who broke the Bank of England. Shorting is one of Soros’s specialties. Thus, while everyone is watching for the next big stock market move—whether it is bearish or bullish—Soros may have his keen sights elsewhere. Watch for George Soros betting against the U.S. dollar in 2017. Soros prospers when he spots a weakness, accelerating whatever destructive potential it contains. As it happens, the prospect of a weak U.S. dollar in 2017 has already happened. Taking the euro as a comparison, the dollar has lost much ground lately. It’s gone from trading near EUR/USD parity at 1.03 to 1.11 and counting. There’s no conflict of interest there. It’s not the same as a business journalist writing favorably or negatively about the stock she or he owns. Therefore, George’s Soros’ opinion on the U.S. dollar carries tremendous power. If he thinks it will go down, he can manipulate political and market forces to facilitate whatever outcome works best. The billionaire speculator has always managed to place winning trades in the market. Understand that Soros is not gambling. Rather, he plays such games with a combination of skills combining poker and chess. He plays the game with the confidence of someone who is convinced he will end up with the winning cards in his hands. Will the U.S. dollar collapse? The better question might be whether George Soros can fuel the political turmoil in such a way that Trump ends up destroying the dollar. Indeed, stirring the pot in Washington is what Soros can do to make it happen. Still, Soros is not always infallible. George Soros’s market predictions have sometimes failed miserably. In fact, the last time Soros was forced to eat crow was after the U.S. election. He was sure that Clinton would win, and he placed his trades accordingly. He favored the kinds of stocks that would have gone higher had Clinton won. But not all is lost. There’s that famous saying about those who laugh last. Soros seems intent on doing just that. The markets have reacted favorably to Trump’s victory. Despite his unusual policy priorities and as yet unfulfilled tax cuts—which are supposed to encourage investment, jobs creation, and the repatriation of trillions of dollars held in foreign accounts—Trump has yet to score a real political win. The Markets Are at Record Highs, But Can It Last? The markets are pushing the Dow Jones or the S&P to new heights. Meanwhile, if America has been able to ignore the dense cloud of political risk that now follows Trump everywhere, it’s because for much of the past week, Trump was engaged in his first major trip abroad as president. Yet, in Washington, the FBI investigation, which recently engaged the services of former Director Robert Mueller, continues unabated. During the trip, the FBI team called for Trump’s son-in-law and advisor Jared Kushner to return to Washington as soon as possible. Trump’s firing of FBI director James Comey was a legal but unusual act, which precipitated an intensification of the investigation into the Trump team’s cultivation of ties to Russian officials during the 2016 presidential campaign. There’s not even an attempt to mask what the motives of the investigation—and so much of the mainstream media behind them—actually are; they are pushing for impeachment. 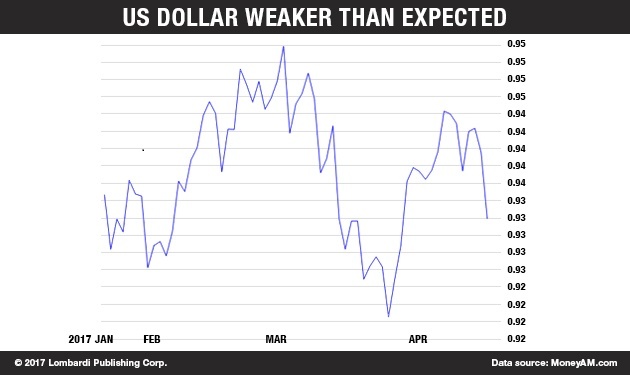 Thus, not only can Trump prompt instability in the markets, shaking stocks down from their recent record highs to a thumping fall, but his political woes could also result in a major U.S. dollar devaluation. Regardless of his personal vendetta or feelings against Trump, George Soros is a master at exploiting such situations. He is sure to go after both the U.S. dollar and the stock markets, just as he did when he pounded the British pound to a pulp in 1992. The record ride that stocks have had on the Wall Street roller coaster is about to reach its first major and thrilling slope. The S&P 500 has risen by 260% since the low of March 2009, and the price-to-earnings (P/E) ratio of many stocks is positively crazy, especially considering certain tech stocks like Snap Inc (NASDAQ:SNAP), the recently floated company behind the “Snapchat” app. The P/E ratio average is now settling between 17 and 18. That’s clearly above the long-term average of 11 to 12. Few traders have asked themselves whether such ludicrous price-to-earnings ratios are warranted. Frankly, when share values go up and everyone’s making money, it’s difficult to be the first to ask questions like Cassandra. 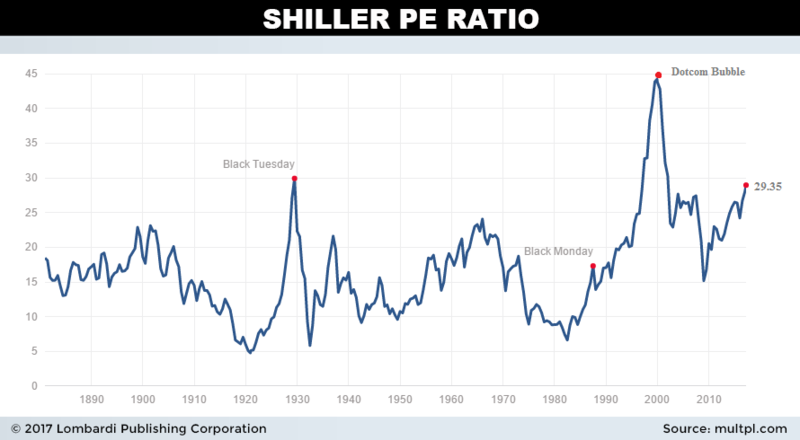 Consider the Shiller P/E Ratio. Sharp and experienced market observers like Soros are doing just that. They are watching the market like sharks, waiting for the right moment. They’re waiting for the black swan that will signal the moment to bring the Trump bull market train to a screeching halt. There are many Wall Street top dogs waiting for a market crash. Many of these professionals made the wrong predictions about the course of the U.S. stock market, had Trump won the elections back in November. On November 6, 2016, just two days before Trumps’ election victory, David Stockman advised investors to sell their shares as soon as possible because he expected a price drop of up to 25%. Stockman was a Cabinet member between 1981 and 1985 under President Ronald Reagan. That said, if the Fed should act on its plans to raise interest rates, it will put a damper in the administration’s growth plans. Still, the overall economic growth numbers may force Fed Chair Janet Yellen to forego this policy. The president, for his part, would appreciate a lower dollar, but he may end up with both a dollar and market crashes to confront. If the Fed were to continue its policy of raising rates, the U.S. dollar would gain too much strength against other currencies. A strong dollar, in fact, would damage the interests of the blue-collar workers, whose interests Trump promised to pursue. Moreover, Trump has fostered a protectionist climate along with the growing mistrust of America’s top trading partners. This could prove lethal to the U.S. economy. Now, if Trump had any political credits left, he could use some policy levers to balance the precarious situation. Clearly, to ensure the success of the economic policies that Trump entertains, he could use political will to persuade the Fed to maintain a weaker dollar and a less rigid monetary policy than the one needed to keep inflation under control. Therein lies the problem. Trump’s political credit is running out. Trump has few political cards to play now and the investigation into his presidency will soon catch up with the markets. That means Trump will be unable to manage a falling dollar, which risks collapsing. Investors around the world, including the major buyers of U.S. debt (Treasuries) like China and Japan, might pull out, losing confidence in the dollar and accelerating its descent. Overall, considering the combination of actual growth potential and political risk in the United States, the markets point to the U.S. dollar as being a weak currency in 2017. The GDP figures meanwhile suggest that inflation is not increasing. This puts a damper in the Federal Reserve’s plans to raise official interest rates as expected. Such a scenario defies what most investors are thinking. Yet, it’s exactly the sort of thing that allows “predatory” investors like George Soros to thrive.